The Milwaukee Public Library approached me last spring to see if I had any interest in working with them to design a brochure for a new acquisition, The Vogel Family Papers. This is a collection given to the library by the Vogel family, a family with very deep ties to the city of Milwaukee, dating back to the mid-1800s. The collection contains photos, letters, ledger books, brochures, and many other items that are both personal and related to the family’s tannery business. I was particularly excited about taking on this project because aside from a BFA in graphic design, I also have a second major in art history. It is rare that I have the opportunity to combine both of these areas of study. I was thrilled to view these fantastic materials first-hand at Central Library, and am happy to report that this collection is open to the public and you can do the same, by appointment. Often when I am working on a design project, I am provided photos that were taken prior to the onset of the project. That was not the case with this brochure. 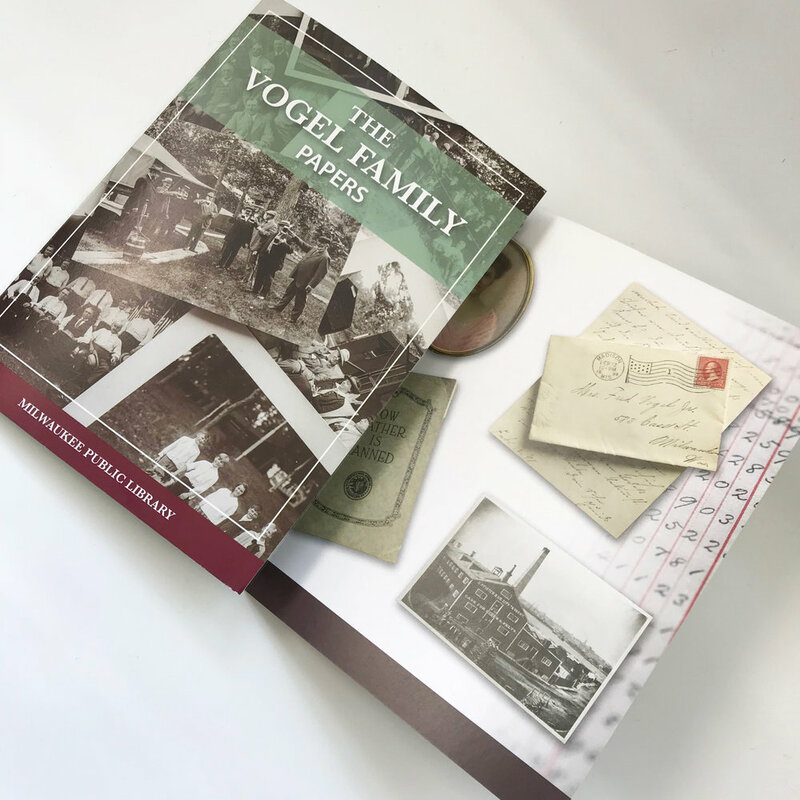 For the Vogel Family Papers brochure, I was able to design it first, and then the photos were taken after. I laid the brochure out so that the family tree is on the inside flap which appears next to the historical and biographical notes for easy reference as that information is read. I used the inside of the brochure to showcase a handful of the amazing pieces in the collection, including the ledger book that dates back well over 100 years. I chose to feature family photos on the front and back covers. The warm browns, deep reds, and greens of the color palette are inspired by the original tannery leather swatches in the collection as well as the beautiful burgundy color from the Milwaukee Public Library logo. I kept the grid and the fonts simple and easy to read, not wanting them to detract from the content and imagery. Once I had an idea of how the brochure would work logistically, I worked closely with an amazingly talented photographer, Scott Paulus. Together with library staff, he worked his photography magic while I art directed based off my layout. This effort resulted in incredible photographs, tailor-made for this brochure. I am very pleased with how this project turned out, and I feel that it is a testament to the collaboration that went into making it a reality.